For almost six years Greece has been on the cusp of financial disaster. For almost six years Greece has been on the cusp of financial disaster. Its Northern European and international creditors have extended loans, suspended interest payments, and forgiven some debt. But European lenders have also stubbornly kept to the old-fashioned principle that debtors freely borrowed their money from lenders, and therefore most borrowed money must be paid back, regardless of the current financial status of the debtors. Greece counters that after all sorts of austerity budgets, it simply can no longer inflict the necessary pain on its relatively tiny population to squeeze out enough cash to pay its well-off creditors. In other words, borrowed money only sometimes must be paid back — depending on the relative wealth of the respective borrower and lender. Economists still bicker over what caused the crisis. Was it Greek structural inefficiencies coupled with appetites for expensive foreign imports that Greeks could not afford? In the last decade, high-priced Mercedes cars became as common in Athens as the swimming pools that dotted the Aegean landscape. Was the Greek tragedy more due to endemic corruption, rampant tax evasion, and cronyism? Longtime residents of Greece knew that it was a national pastime to conduct business off the books, to give discounts for non-reportable cash payments, and to cram bloated state bureaucracies with friends and cronies. Or maybe the borrow-and-spend spree could have continued were it not for the 2008 financial meltdown on Wall Street that stopped the merry-go-round of lending and borrowing? Politicians likewise fight over the best ways to solve the crisis. Write off the Greek debt but make Greece abandon the euro and perhaps the European Union as well? Or write off the debt but only in exchange for radical reforms in the Greek economy that will preclude another borrowing spree? Or write off the debt and just let Greece do as it pleases? Behind all the acrimony is an unspoken Greek assumption that has nothing to do with either economics or politics, but reflects a growing trend around the world. Athens has adopted the equality-of-result mentality that believes factors other than hard work, thrift, honesty, and competency make one nation poor and another rich. The thinking goes something like this. The rich Northern Europeans have more money per capita than do the Greeks. They could write off the entire Greek debt and not really miss what they lost. In the Greek redistributionist mindset, why should one group of affluent Europeans grow even wealthier off poorer Europeans? Athens has adopted the equality-of-result mentality that believes factors other than hard work, thrift, honesty, and competency make one nation poor and another rich. Instead, sheer luck, a stacked deck, greed, or a fickle inheritance better explain inequality. Fate or cosmic unfairness can result in good but poor people owing money to bad but wealthy people. Default, then, is sometimes morally justified. The Greeks fault their most prominent creditor, Germany, for its cruel past Nazi occupation of Greece, for its cold obsessions with the financial bottom line, and for its ethnocentric manipulation of the euro and the EU itself. Something similar to the Greek mindset arose during the U.S. housing bubble and collapse of 2008. Millions of Americans unwisely took out subprime mortgages for houses they could not afford and then walked away from their debt when the economy tanked. They understandably blamed Fannie Mae and Freddie Mac, avaricious Wall Street speculators, rah-rah realtors, and dishonest banks that pushed overpriced homes and mortgages onto the unsuspecting. The current student-debt fiasco is also similar. Young people who have little money owe lots of it — $1 trillion in aggregate — to banks that already have lots of it. It no longer matters how the debt was incurred, only that poor students and ex-students are unlikely to pay most of it back. Everybody but students is supposedly to blame. The universities constantly upped tuition costs while pushing loan packages on students. The weak economy offered few good jobs to the recently graduated and indebted. The government foolishly guaranteed the loans and thus greenlighted greedy campuses and banks to charge whatever they pleased. Students are as likely to pay back their $1 trillion as Greece is its $350 billion. The Obama administration is sympathetic to the mindset of debtors. Its sloganeering suggests that wealth creation is either not really the work of the individual (“you didn’t build that”) or something that reflects greed rather than thrift (“I do think at a certain point you’ve made enough money”). Greece will not pay because an increasing number of nations in the Western world do not look at borrowed money as a contractual agreement that is central to a modern economy. Instead, they see renouncing debt as both a moral act and a reasonable method of wealth redistribution. Payback depends not on who legally agreed to what with whom — but on who has money and who doesn’t. In short, debt has been redefined as equality and fairness. This brilliantly chronicles the devolution of the mindset from one of doers and makers to that of wishers and takers. Just how did the “pursuit of happiness” as a right get corrupted in the shuffle? Germany and the rest of the EU are very unlikely to allow Greece to become anything like a failed state. And Greece knows it. If they don’t pay they have the leverage of threatening to make things worse for everyone else. They can exhort their own people to flee Greece and go elsewhere in Europe. They can push the recent flood of illegal immigrants from Africa and Syria to the rest of Europe. They can create something akin to a humanitarian disaster for Europe – a Europe more sensitive to things that like than filthy lucre. After all, there’s always a few Germans to flog harder to pay for it. Greece is already looking to Russia to bail them out. Who knows? Maybe Turkey can get massive concessions to lend them money. Maybe Abu Dhabi can pay them, privatize all the ports and gain a beachhead in Europe. The Greeks don’t seem to care as long as someone else is paying. But it would be fascinating to watch the ECB mumble at its shoes on the day it realizes that Qatar is the only thing keeping the euro from imploding. Or something like that. We are now witnessing the wisdom of his remark as Europe sloshes around with trillions and trillions of phony paper derivatives all tied to nothing! Should the Greeks default—–will anyone ever loan them money again?..I was in Greece on a tour when Nixon removed the U.S. from the gold standard.. The Greek business owners immediately refused payment in U.S. greenbacks but would accept traveler’s checks.. Of course any change would be in the form of drachmas, which were about as popular and spendable as East German deutsch marks. It seemed , at that time, the main economic opportunities for the locals were their Greek ruins. The cities were noisey,and polluted from the cars and trucks. Other than the tourist trade and cottage industries for the souvenir business–not too much in the way of industry or manufacturing.. Greece also is lacking in natural resources. If their debt is forgiven–it will not be long before they are in another quagmire. The bureauocracy will continue and the Mercedes and the swimming pools will again be prolific. Unlike the U.S.A. the Greeks cannot fire up the printing presses. Yep, that is where we are and have been for a long time. Get in debt, satisfying your “wants” and not your “needs” that you cannot repay. Declare bankruptcy, and walk away, start anew. The American way. This occurs at all levels, the government, the banksters, the greedy, the entitlement sector. OK. What do you think will happen when Greece does not pay its debt to the IMF on June 30th and is declared a defaulter? They will leave the EU and the euro, what then? There will always be income inequality because there will always be behavioral inequality. Blaming the rich for income inequality is like blaming valedictorians for grade inequality. I am definitely in favor of debtors paying their debts (especially if they owe me money)! But why are creditors making the loans? To get interest and that interest is established because there is a risk of loss. If creditors don’t want to take that particular risk, they can spend the money or (maybe more risk) take an equity stake in a business. For creditors to expect that they can invest and then do no work and have no risk of loss, is asking a lot from a hostile world. Should other people be sympathetic to creditors who lose in such situations? With Greece and student loans, maybe the problem is that governments have stepped in to bail out the individual creditors, who otherwise would have lost their money and then maybe learned a lesson about the risk associated with interest. Also, as a related issue, I suspect that the issuance of excess credit is inflationary and drives up prices and may put pressure on people to borrow to pay unnecessarily high prices. For example — is it possible that less availability of student loans might lead to less expensive ways (more technology and less fancy buildings) for students to get the education they need? Maybe thrifty hard working people would benefit from taking a little bit of time off from hard work, to determine what is the best way to invest their time, in case governments (taxpayers) ever stop bailing them out. If I owe my friend $100 but can’t pay, I have a problem. But if I owe him $100K and can’t pay, he has a problem. The EU has a problem. Scot McBeath, you are on to something here. Savings can only expect interest if other people accept a loan. Without those “poor beggars” there would never be any interest. So much for the accounting side of things. Trouble is, the financial sector promises more than the debtors could pay. Beyond the accounting a second question arises. What goods and services materialize the interest? Overall there can be no real-value in interests above economic growth. To put this into a California perspective: if the finacial sector promises 7% interest that would need to manifest itself in 7% deeper wells by the end of the year. If the wells stay all the same all dreams of real value interest vaporize. Just don’t blame the debtors for it. And don’t forget health care. Good news for savers; when the promise to repay debt is broken, the cost of borrowing goes up. “”” Chart of the day the demographic hump contra corner””. From the famed David Stockman. 121 million employed full time—123 million in 2007, population has gained 23 million since then. We are being Zuckered, but then, the Zuckerburg has a safe-room island somewhere if things get bad enough. By continuing to shift the Nations attention to the trivial, the passions, or pacifier ideas given to those still teething, ” The status quo is maintained. What those who are guiding the United States to ruin have failed to grasp is—- The “land of the brave” is the sentinel, the 50-state-headed Cerberus, guarding the World from the underworld axis powers. Continue to weaken the guard-dog and the underworld comes a knock-in. “”timothy p carney speaks to bobby jindal at SRLC.”” 5 minute video— bobby says go bold. There are two German model the EU could impose on Greece. One is “German-style Hartz IV reforms that have impoverished the bottom fifth of German society” ( Ambrose Evans-Pritchard http://www.telegraph.co.uk/finance/economics/11687229/Greek-debt-crisis-is-the-Iraq-War-of-finance.html ) As a German I concur with this analyis. Such measures imposed by the EU led to an increased rate in child mortality and suicides in Greece today. The other German model reflects a situation similar to Greece, only 25 years ago. When West Germany introduced the Deutsche Mark as single currency to unproductive East-Germany the country could have collapsed in an instant. Only then we pumped money into the East, built infrastructure and pushed for comparable wages. I am ashamed of my government, especially with a chancellor who grew up in the East, to deny Greece the solution that actually worked in East-Germany. Now the EU rather pays for tens of thousands of illegal immigrants coming from North Africa. Europe wastes an opportunity. Now is the time to draw the line. There’s islamism, Papa Putin, and illegal immigration on the other side. Greece should be on ours, no matter what. Unfortunately Greece cannot make money like Taylor Swift. If it could it would perfectly live on royalties every time someone uses the words democracy or Europe. Both of which are Greek. The Greek fracas is fascinating because we are seeing economic reality run smack into political reality. 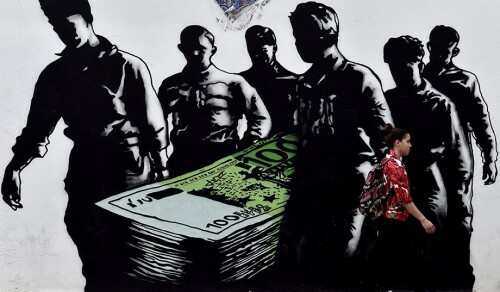 The Greeks won’t or can’t keep up with their interest payments, it hardly matters which. It also does not matter what their mindset is, they are going to default — this was baked in years ago. Greek default is the only sensible thing to do. The world has orderly ways to do this and this is what needs to happen. And no amount of moralizing or hand-wringing about it matters. Everyday is a Sunday. Still they are parting and living for today. When I was in Greece for 12 days, about 10 years ago, almost all the small shop owners would by pass the cash register and just put the purchase money I gave them in their pants, or in a small box next to the cash register. That’s the business accounting system that I witnessed. Let’s not forget how Iceland managed to recover after the Euro devastated its country. No one is bringing up the point that since 2008, Iceland’s economy has rebounded since leaving the Euro. While Greece may have cooked it’s books prior to joining the Eurozone and lacks any credible tax system, let’s not think that the EU will suddenly unravel because of Greece. Even the IMF agrees, Iceland is better off and can serve as a role model for other EU countries. The only countries seriously interested in the Eurozone today are those who are already in financial trouble; Poland, Romania, Slovenia, Croatia, etc. Switzerland and the UK wanted nothing to do with it and our Nordic friends also avoided switching currencies, and they are all doing quite well without it. You scream about the growing cost of a college tuition in American students, knowing it would take 15-20 years for an average student to pay off a $100,000-plus college debt while living in your basement. And that’s okay? Or would you agree that colleges and universities have colluded with the banks to raise tuition, and therefore it would be okay for your son or daughter to default so they don’t have to live in the basement? Now apply that logic to Greece. Which is it? Keep your children living in the basement while defending the banks or let those who put them there suffer for their own unethical financial behavior? Well, Thucydides warned us about the dangers posed by demagogues; he pointed out the flaws of allowing the average man to vote according to his prejudices (notwithstanding reason). What’s going on in Greece is merely the logical conclusion of creaping socialism. Every Western country suffers from this problem in one degree or another. The only difference here is that the Greeks are further advanced down the road to ruin. I recall that Churchill said something to the effect that democracry is a poor system of government, but that all the alternatives were far worse. Yet, if he were alive today, Churchill would be horrified by the level of welfare bribes which are doled out, about the minefield of regulations we must negotiate every day, about the expropriation which occurs at every turn in the name of “fair” taxation, etc, etc. Blame the borrowers? Give me a break. The banksters have known all along that the Greeks are deadbeats and that student loans are a scam. So why do these expert financial intermediaries loan the money anyway? That would be a good question, except that after seven years of the biggest looting of wealth ever seen on planet earth, from savers to the banksters via artificially low interest rates — some $15 trillion since the ’08-’09 crash last time I checked — to keep the banksters liquid you see — we ought to know already. What the central banks have managed to amass, beyond the rings of Saturn, both out of sight and out of mind, is a great hairy ball of moral hazard. A ball of it so big that it makes the asteroid that killed the dinosaurs look tame by comparison. Sounds like a good idea, I’m all for it. But who actually signed on to those loans? Not “Greeks”, but oly particular individuals. Very well then, let those individuals who actually did the signing pay the debt. They were the same ones who squandered the loans on such white elephants as the Olympic games. You may say, “Those individuals represented all Greeks”. What, even those Greeks who opposed the loans? Some representation! The whole thing is a racket for the well-connected. Sorry, Greeks do not owe anything. The scum they happen to have in government, like all government scum, are responsible. Let Greece leave the EU. Perhaps it will get help from Russia or more likely China. After that, let them give excuses to China for not paying back the money and see what China does. Borrowing with the idea of never paying back has another name: stealing.